This World Cup has been filled with great moments and it is sure to live long in the memory for football fans around the world. 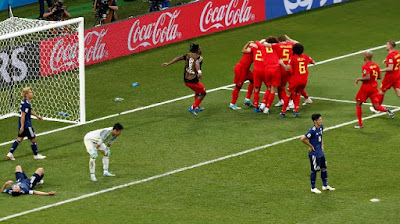 Unfortunately for Japan in being part of another great World Cup moment their dreams ended in the most dramatic of fashions on a very warm evening in Rostov. After some pretty uninspiring tactics from Japan, a last 16 tie was set up with Belgium on the 2nd July. A match that on paper looked like it would be a step too far and a bet on Japan to continue their winless streak in knockout World Cup competitions was a sure thing. If you thought that not many people would have disagreed with you. Although Japan looked to upset the odds against Belgium and after an opening 45 minutes, they looked confident. As in close to 30-degree heat at the Rostov Arena, the side pressed Belgium well in the opening half as the team went in goalless. The opening seven minutes of the second half was to be the stuff of dreams however for Japan as they raced into a two-goal lead. The first came from a beautiful finish from Haraguchi from around eight yards out into the bottom corner. The second on 52 minutes was even better as Inui slotted the ball into the net from outside the box. The great times for Japan were not to last as two headers from Belgium's Vertonghen and Fellaini had the tie heading for extra time. In then the worse of scenarios for all involved with Japan with virtually the last kick of the game Belgium found the winner through Chadli in the 94th minute. The goal came from a counter-attack which sums up how Japan played as they never sat back. Following the game, everyone was very complimentary on Japan's performance and agreed it was a horrible way to lose a match. However, after the game, Osako said: "We should have been more conscious of keeping the game 2-0." From these comments, Japan will maybe regret not sitting back a bit after going two ahead and trying to frustrate Belgium. Although you have to admire their attacking display and they for sure go home with their heads held high.